Something very interesting happened to me the other day. I went over to my friend Drew's apartment in Brooklyn. While I was crossing the street, someone called out my name. Turning, I saw a guy in a car. He seemed to know me but I couldn't place his face. I went over to the car. He had a beautiful little daughter sitting in the back seat. She was so friendly and chatty. Did I know these people? Suddenly he said, I know you from your blog. I have been following your work for years. I was stunned. A fan had randomly found me on the street. Wow. A celebrity. My head became very swollen. He was a very nice guy. He asked if we could draw sometime. Well hell, of course. I gave him my card and I'm waiting to hear from him. I'm sure I'll do a post when we go sketching in Brooklyn. 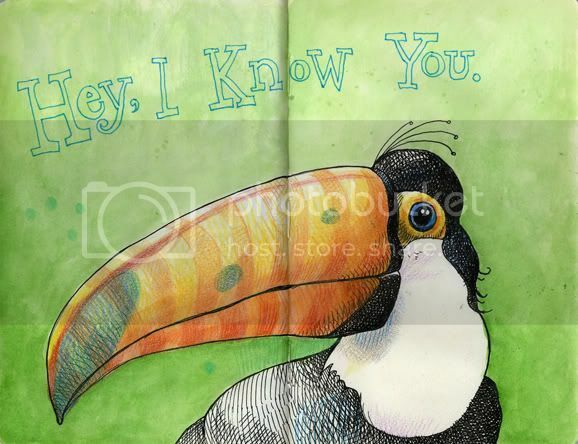 Oh, and I like your toucan too! Really nice toucan. The energy of the colors are very vibrant. Is that one drawing on two sketch pages? Nice. Yes, a lot of my drawings are across 2 pages. That's a cool story, Tommy. Oh, somebody already said "cool." So be it. Love all your sketches too. This bird is a winner. Well I must confess that I would be a bit starstruck if I ran into you on the street in New York. I love your work. You've a lot into tropical stuff lately, Tommy. Was there a toucan in your spot as well? And I'll sure look around next time I go up to NYC. Bald guy, right? Tommy, love the toucan. You have a great style. Thanks for the stickers too! Everyone in Idaho loves them. What a great story! Love your work too.